Over the years DIFP has published some documents relating to Irish commemorations of the dead of the First World War in the 1920s and 1930s. 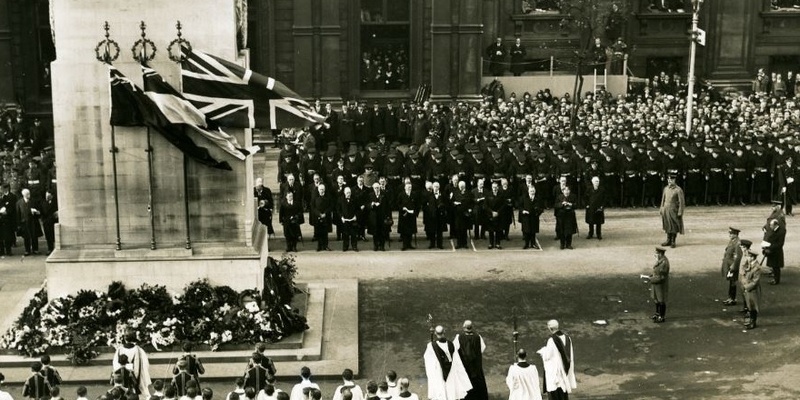 The image above is of the annual Armistice (or Remembrance) Day commemoration at the Cenotaph in London in November 1926. What makes it relevant here is that in the second of the two rows of dignitaries to the right of the Cenotaph, the second last figure is the Irish Free State’s Minister for Justice, Kevin O’Higgins (from whose papers in UCD the image itself is taken). Commemorating the dead of the First World War was politically sensitive in independent Ireland. Military service by Irish soldiers in the ‘Great War’ had generally taken place in the British armed services. This was problematic for a state that had recently emerged from a political and military conflict with the British, though at an official level, Irish governments were prepared to commemorate the dead of the war to some degree. W.T. Cosgrave of Cumann na nGaedheal, as President of the Executive Council of the Irish Free State (the equivalent of the post of Taoiseach) was invited to attend the Armistice Day ceremonies while attending the 1926 Imperial Conference in London in October-November 1926. But in a letter to UK Prime Minister Stanley Baldwin he declined on the grounds that, as he had fought in the Easter Rising of 1916, and as casualties had been incurred ‘on both sides’, as he put it, his presence might be seen as insensitive to those Irish people who had been bereaved by the loss of loved ones serving in the British Army during the Rising. Instead, O’Higgins, who was Cosgrave's vice-president and whose brother Michael had been killed while serving in the war, went in his place. This was not a once-off; as late as the 1940s, the Irish High Commissioner in London, John Dulanty, continued to represent the Irish government at the annual commemorations of the 1918 armistice. The commemoration of the First World War recurs at intervals throughout the DIFP volumes, from this 1924 letter by Department of External Affairs Secretary Joseph P. Walshe on the willingness of the Irish government to be represented at such commemorations, to the protocol issues vis-á-vis Irish and British representatives at official commemorations in Brussels in 1926 ,to an account of Bohemian FC laying a wreath whilst playing in a tournament in Belgium in 1929. But perhaps most interesting of all is this 1939 memorandum by John J. Hearne, Ireland's High Commissioner to Canada, in which Ireland’s participation in Armistice Day commemorations segued into a consideration of how Irish neutrality in the Second World War was viewed by his Canadian hosts.